Back by popular demand, Matt Norman returns with this relaxed, fun weekend focusing on the mandolin and mandolin family - mandolas, mandocello, bouzouki etc. The weekend will include masterclasses on technique and the opportunity to play in ensembles. There will also be interesting information on the history of the mandolin and a performance given by your tutor. Matt is a fine mandolinist in folk and classical styles as well as being an experienced teacher, workshop leader and conductor. He has a relaxed teaching style that puts people at their ease whilst getting the best from each player. 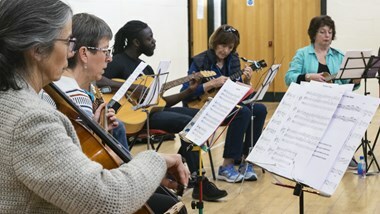 This course will suit anyone who can already play the mandolin, other mandolin family instruments are welcome but please mention when booking so suitable music can be provided. It will be necessary to read music and the music will be sent out in advance.